Mobiom Template is elegant and creative HTML 5 Bootstrap 4 Responsive one page template. 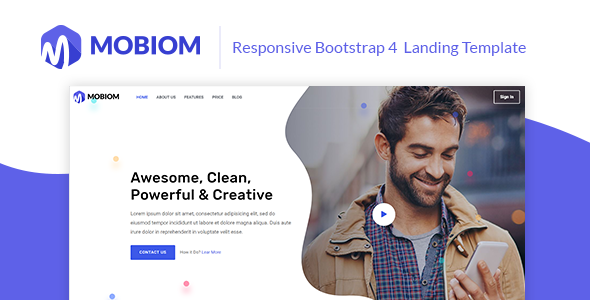 Mobiom is built with Bootstrap 4 Framework, HTML 5, CSS3 and SASS, Mobiom is Compatible with Desktop, Laptop, Tablet, Mobile has been tested on real devices. This design is very easy to customize and all files and code has been well organized and nicely commented for easy to customize. This is purely an HTML/CSS template and not a WordPress or any other CMS theme.